Wm. 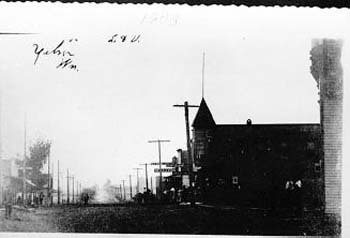 Nelson, a logger, has been committed to the Steilacoom asylum. He had an idea that he was possessed of the power to walk on water, and notwithstanding he had to swim every time he tried it, he persisted in repeating the attempt at frequent intervals. George W. Whitlach, of Yelm, died at Centralia, Wednesday. He recently sold his farm, the old Lotz place, for a good price. A fire from a slab pile destroyed the mill of the Chehalis Lumber Company, on Lincoln Creek, three miles west of Centralia, Wednesday afternoon, including several fine residences occupied by the officers and a number of houses in which the laborers lived. The loss sustained in between $80,000 and $100,000 and drives about 40 men out of employment in the mill and camps. Ten of the school districts in the southwestern part of the county have, under the new law, been consolidated with Yelm, to increase the efficiency of the schools, making a strong district to replace the many weak ones. The districts included are 13, 38, 40, 42, 43, 53, 66, 69 and 72. District 69 is a consolidation of 24 and 41, which makes practically ten districts. Mr. W.T. Melvin, who with his wife, are over from Everett on a visit to their daughter, Mrs. A.W. Robertson a few miles out in the country, visited friends in the city a couple of days this week. Loggers are protesting against the Nisqually bridge, alleging that the river is a navigable stream and the piers will interfere with logging. The matter has been referred to the War Department at Washington. A case of diphtheria is reported in the Crodle family, who live near Offutt’s Lake. A freight train on the Northern Pacific was derailed Wednesday morning of the track between Rochester and Grand Mound. Seven cars left the track and it required all day to restore them. One of the cars that “stood on end” contained a shipment of eggs, only one case was injured, and that only to the loss of a few broken eggs. This Friday evening at 7:30 o’clock at Rabeck’s hall the local Socialists will hold their usual weekly meeting. The question up for discussion is: “The Inflexibility of the United States Constitution.” Miss Frances Sylvester has promised to be present and lead off in the debate. Last week four new members joined the local. These meetings close at nine o’clock sharp. Eighth- A blockhouse was built on Yelm prairie, for protection of a number of families, but I am unable to give the location at the present time. Ninth- A blockhouse was built at the crossing of the Nisqually river, for the purpose of guarding the ferry there.